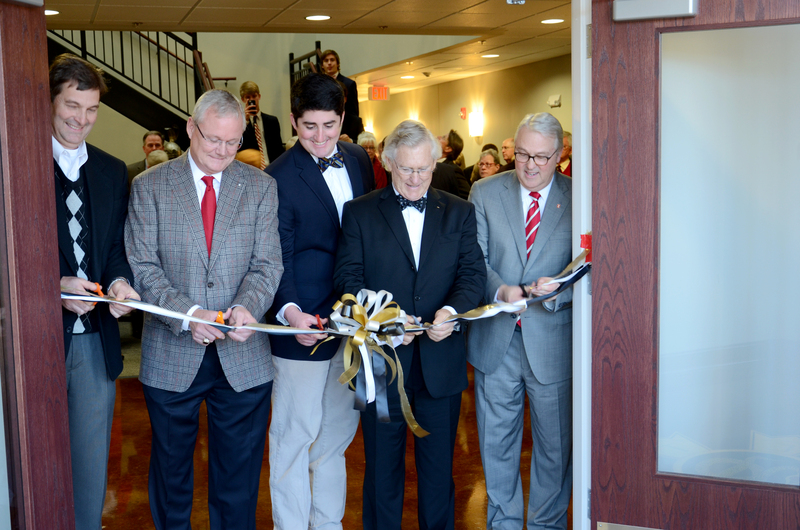 The new Beta Tau chapter home was a project of over eight years in making. 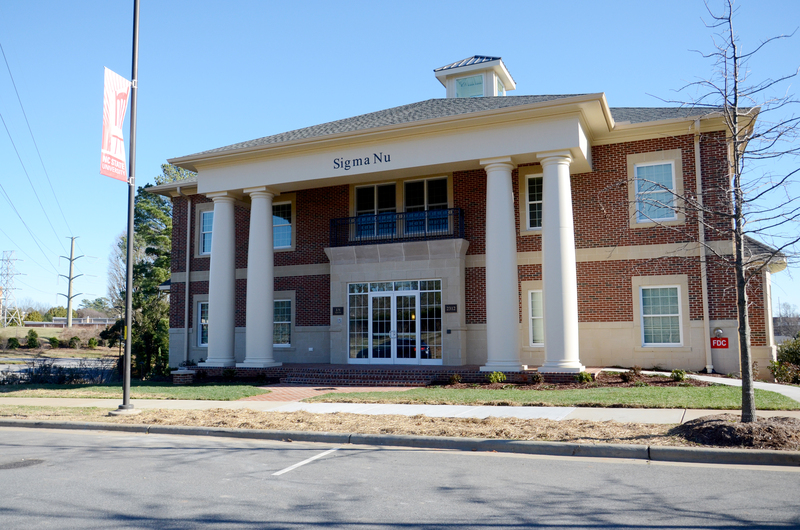 Eight years ago, the alumni of Beta Tau Chapter at North Carolina State University formed a committee to pursue new house construction in the university’s redeveloped Greek Village. 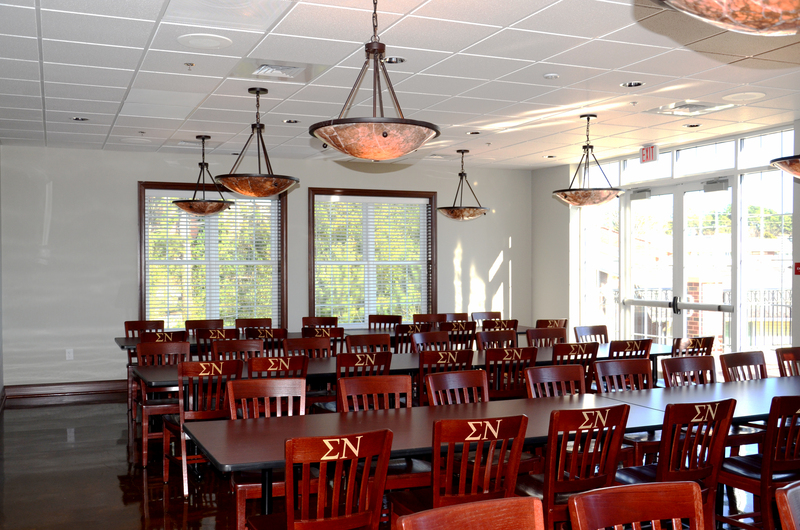 The goal was to design and construct a grand chapter house that would exemplify Sigma Nu’s legacy as the oldest fraternity on campus. Brother Randall Ward pledged the initial one million dollars to kick start the campaign in 2007. Howard Pickett, Richard Vaughn, and Johnny Mack Alexander also made additional financial commitments that year. However, the U.S. economy faltered shortly after early fundraising efforts began, which hindered the expected progress of the campaign intended to fund the $4.6 million home. Finally, in 2011, with $2.3 million in pledges, the committee began searching for bank financing to get the project started. For 18 months there was no progress. That’s when Steve Ratterman (Indiana) referred Howard to Jennifer Henson of Residential Capital for help in sourcing a bank loan. A member of Alpha Xi Delta and former President of the organization’s national housing corporation, Jennifer is skilled at helping Greek organizations navigate the complexities of securing financing for the acquisition or renovation of their chapter houses. Jennifer has focused her career to this end. She endeavors to translate the Greek experience to bank officials whose only perspective on the topic may have come from watching Animal House. “Unfortunately, a lot of loan officers don’t understand how the Greek system not only strengthens college campuses but also that the chapter house living experience is critical to the development of our young men and women,” she says. The new Beta Tau chapter home is only one of four in the Greek Village with a basement and two stories. At 24,500-square-feet, it is the largest house that can be built on campus. Inside there’s a full commercial kitchen, an elevator, dining hall and classroom for LEAD events. She understands the value of a chapter being able to provide a suitable living environment for its members. “Whether through CHIA (the Collegiate Housing Infrastructure Act) or other initiatives, we have to keep providing safe, affordable housing that our alumni can be proud of visiting. In this day and age, with millennials having a different opinion of housing than I did when I graduated in 1976, we have to keep it fresh and new in order to keep our chapters strong,” she says. When Jennifer brings together the university, the lenders and the Greek chapters who wish to build new housing, she focuses on alleviating concerns for all parties involved. “It’s just a matter of bringing everyone together to figure out how we can accomplish this,” she says. In the case of Beta Tau, once Jennifer gathered all the interested parties in a room, including university representatives Dr. Luckadoo, Vice Provost for Campus Life; Mary Peloquin-Dodd, CFO; Laura Ratchford, General Counsel, it took only two hours for the lender to agree to go forward on Beta Tau’s loan. Afterwards, the committee went right to work and hired Omega Construction and Gontram Architecture to proceed with the project. Sigma Nu was the first to select its plot of land and begin construction in Phase I of the Greek Village. As a result of their experience, Sigma Nu paved the way for the other Greek organizations to follow in their footsteps with their own housing projects in the Village. Beta Tau’s house is one of two newly completed Greek houses at NC State. The undergraduate members moved in last January to the new house, located on two-thirds of the original lot where the previous Sigma Nu house was positioned, at the highest point on the campus. The facility is only one of four in the Greek Village with a basement and two stories. At 24,500-square-feet, it is the largest house that can be built on campus. Inside there’s a full commercial kitchen, an elevator, chandeliers in the dining hall and a four-story high open staircase that, when lit at night, can be seen all across campus. While the building is brand new, the committee took care to install pieces of Sigma Nu history that would live on with future generations. In the front left corner of the yard, a piece of the original rock where Sigma Nu was founded in 1869 rests on a pedestal, honoring the Fraternity’s rich history. In addition, the front steps of the house are framed on either side with two coins and nine bricks from the old Carolina Inn, where Beta Tau was founded in 1895, which was torn down in the 1970s. The bricks were salvaged from the Inn and used in the hearth at Beta Tau’s previous house. “Now, any brother who enters the new house will walk a pathway of where Beta Tau was founded,” says Howard. This ADA compliant facility sleeps 37 of the current 89 initiated brothers. The rooms have double sound-proofing between the walls, a speaker system and surround-sound in every room. Bedrooms also provide one electrical receptacle per student where they can quick-charge an iPhone, iPad or laptop computer. Most of the rooms are doubles, except for seven singles reserved for officers and corner rooms that house three men each. Bathrooms are shared by just two brothers. While the rooms are priced differently based on size and accommodations, rent is comparable to what the university charges. Downstairs, the brothers have access to a classroom, designated for LEAD events, chapter meetings and studying, when not otherwise in use. There are two 65” televisions that work simultaneously for viewing meeting agendas or Power Point presentations. 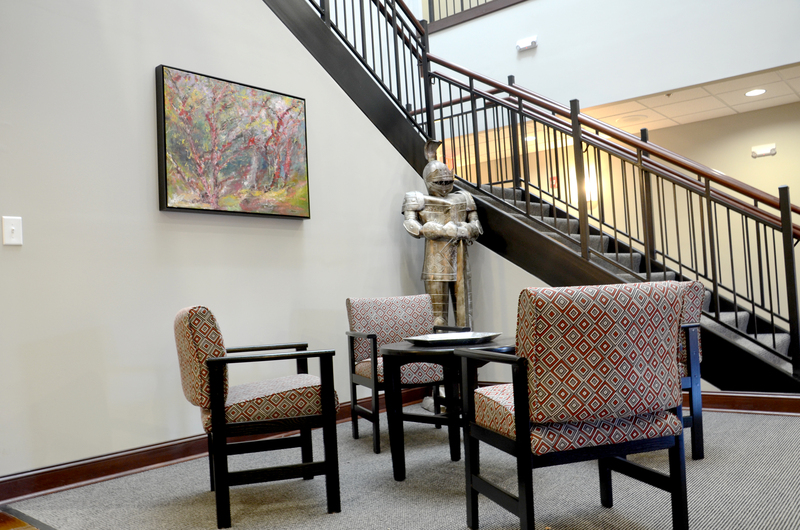 The house also boasts an activity room with a home theater set-up and a 70” television as well as a beautifully furnished Alumni Library, which is used for Alumni Advisory Board meetings and other alumni gatherings. Every room in the house is named for an alumnus based on amount he pledged to the campaign. The house is named in honor of Susan and Randall Ward, for their generous lead gift. The study room is named for Richard Vaughn, the Alumni Library for Howard Pickett and the LEAD classroom for Johnny Mack Alexander. One hundred twenty-five Beta Tau alumni made financial commitments to bring this project to fruition. Of those, the following men also served on the original fundraising committee: Eddie Gontram, Daniel Gunter, Dr. Gerald Hawkins, John O’Keefe, Howard Pickett, Matt Skidmore, Braxton Smith, Rick Tate, Reece Walter, and Doug Yopp. Ribbon cutting at the grand opening. From left to right: Barry Hemmings (Omega Construction president), Howard C. Pickett (Beta Tau House Corporation president), Bobby Porter (collegiate Commander), Randall Ward (Lead Gift for Beta Tau housing campaign), and Randy Woodson (North Carolina State University Chancellor). In addition, Howard asked Richard Vaughn to consult on the project throughout the design, fundraising and construction phases because of his 45-years of experience in commercial construction. Richard was involved in every aspect, including negotiating the contract with the builder and overseeing the quality of their work. “In my opinion, there won’t be another fraternity house built on the campus that is any nicer or has finer amenities than the Sigma Nu house. I’m quite proud of it whenever I go there. The current brothers are bound to be proud of it as well as all the guys who contributed money to build it,” says Richard. There’s no question, the brotherhood has benefited from the new house. Eminent Commander Connor Pilgrim says the members enjoy eating two meals a day together at the house; the entire membership is on the full meal plan. “People are at the house a lot more than before. As a result, we’ve gotten a lot closer as a brotherhood,” he says. The house has also been a selling point in recruitment. The most recent candidate class drew 31 men. “I’m excited because Sigma Nu at NC State has never been over 100. These young men have done a great job recruiting a variety of men who are now involved in the student senate, IFC and elsewhere on campus,” says Howard. The chapter also excels at philanthropy, raising $40,000 last year for St. Baldrick’s to fund childhood cancer research at St. Jude. Finally, this housing project was successful in bringing alumni and collegiate members together to work toward a common cause. Unlike any other organization on campus, fraternities and sororities offer an opportunity for cross-generational involvement. Alumni, like those from Richard Vaughn’s era, have a chance to give back in a meaningful way; and collegians witness the longevity of the brotherhood through those supportive alumni. Connor summarized it well. “Seeing this house built and getting to live here cements the idea that this is a lifelong commitment and not something we’re doing for just four years. It’s a huge blessing and a great honor to get to be part of something so large and to see the dedication from alumni who are willing to build a property like this for kids still in college,” he says. Please se d me so.e info from the sigma nu educational foundation. My address is 125 Ravan Avenue , Harahan, Louisiana 70123.O had asked Pickett to have them send me the information as I wish to give a donation to Beta Tau. We’ve forwarded your message to Educational Foundation staffers. Thanks!